My homebrew club occasionally does style competitions, where we each make our own interpretation of a particular target style. I have found it to be a really fun way to stretch my brewing legs and play with styles or techniques that I don’t normally do. Our February competition focuses on imperial stouts–definitely a new style for me. I usually like the commercial imperial stouts that I sample, but when I homebrew I prefer recipes that are lower in alcohol. Five gallons of kegged imperial stout would just sit around forever. So, I elected to make a 2.5 gallon batch and bottle it. The recipe for this batch is based loosely on the Katherine the Strong Imperial Stout recipe from Gordon Strong’s Modern Homebrew Recipes book. I modified it a fair bit, to account for ingredients on-hand. Because of the small batch size, I decided to do Brew-In-A-Bag for the mash. With the high target gravity, this resulted in a fairly low efficiency (~67%). So, I added half a pound of DME to bring things up to par. In a new technique for me, I decided to try overbuilding my yeast starter. This recipe calls for WLP001, which I use fairly frequently in-house. In fact, some of my upcoming batches will us it too, so I figured that I would harvest enough to save on buying more yeast later. Using the BrewUnited yeast starter calculator for guidance, I made a 2L starter with 202 grams of light DME and ~1/8 tsp. of yeast nutrient. After two days on the stir plate, I poured 1L (~170 billion cells) into a mason jar (December 3, 2015) for later use. I added the grains to 4.85 gallons of water and kept the mash at 154° to 156° for 60 minutes. I raised the temperature to 165° for a 10 minute mash-out. 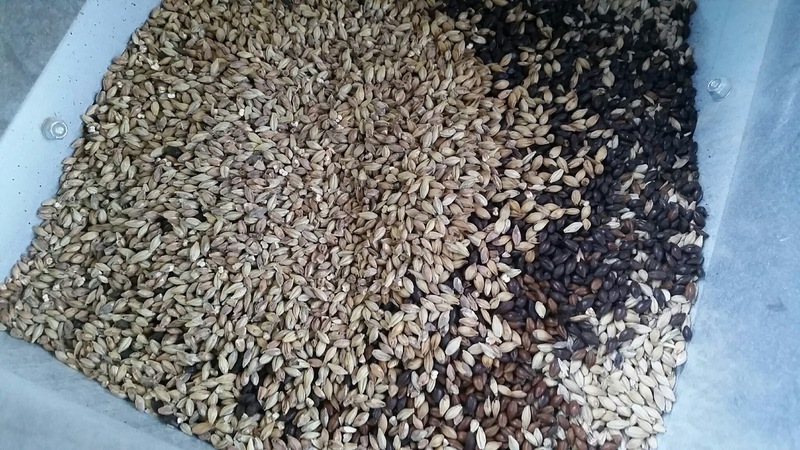 I removed the grains and drained them. I had approximately 3.75 gallons of wort with a gravity of 1.066, for an extract efficiency of 67%. So, I added 0.5 lb. DME (as mentioned above). Once the wort was at a boil, I added the hops and boiled for 60 minutes. I added the Irish moss and yeast nutrients at the appropriate times. After the boil, I chilled the wort, transferred to the fermenter, and shook to aerate it. The starting gravity was approximately 1.093, with 2.5 gallons into the fermenter. I pitched the yeast and set the fermentation chamber for a temperature of 68°. It was fermenting vigorously when I checked on it 12 hours later. This entry was posted in imperial stout and tagged Red Star Imperial Stout. Bookmark the permalink.